Editor-in-Chief Dr. Susan Lynn Brangers, Marywood University, USA. International Journal of Art and Art History is a scholarly journal which supports and promotes the study of the art and practice of art historical writing. The journal is committed to studying art historical scholarship, in its institutional and conceptual foundations, from the past to the present day in all areas and all periods. This journal ignores the disciplinary boundaries imposed by the Anglophone expression 'art history' and allow and encourage the full range of enquiry that encompassed the visual arts in its broadest sense as well as topics now falling within archaeology, anthropology, ethnography and other specialist disciplines and approaches. It welcomes contributions from young and established scholars and is aimed at building an expanded audience for what has hitherto been a much specialized topic of investigation. The journal also accepts notes, reviews, letters, bibliographical surveys and translations in addition to articles. 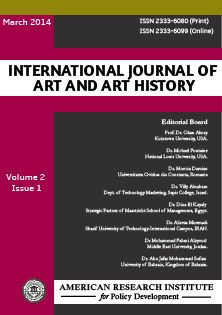 International Journal of Art and Art History is the first international contemporary journal dedicated specifically to the study of art and art historiography and its ambition is to make it the point of first call for scholars and students interested in that area. The journal follows double-blind peer review process. Each paper published in International Journal of Art and Art History is assigned a DOI®number, which appears beneath the author's affiliation in the published paper. Click HERE to know what is DOI (Digital Object Identifier)? Click HERE to retrieve Digital Object Identifiers (DOIs) for journal articles, books, and chapters. Dr. Susan Lynn Brangers, Department of Art, Marywood University, USA. Prof. Dr. Peggy Blood, Dept. of Liberal Arts, Savannah State University, USA. Dr. Eric Nay, Dept. of Liberal Arts & Sciences, OCAD University, Canada. Prof. Alexander Rossinsky, Department of Art, Altai State University, Russia. Dr. Sapfo Mortaki, Harokopio University of Athens, Greece. Dr. Mohd Fauzi Sedon, Dept. of Art and Design, Sultan Idris Education University, Malaysia. Dr. Njeru Sophia, Dept. of Art and Design, Maseno University, Kenya.